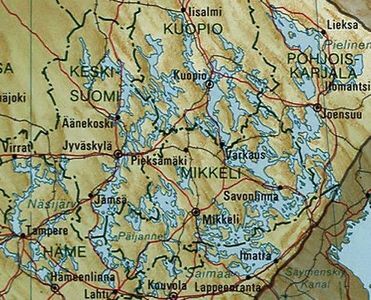 Finnish Lakeland or Finnish lake district is the largest of the four landscape regions into which the geography of Finland is divided. The hilly, forest-covered landscape of the lake plateau is dominated by drumlins and by long sinuous eskers. Both are glacial remnants after the continental glaciers that scoured and gouged the country's surface receded about 10,000 years ago.